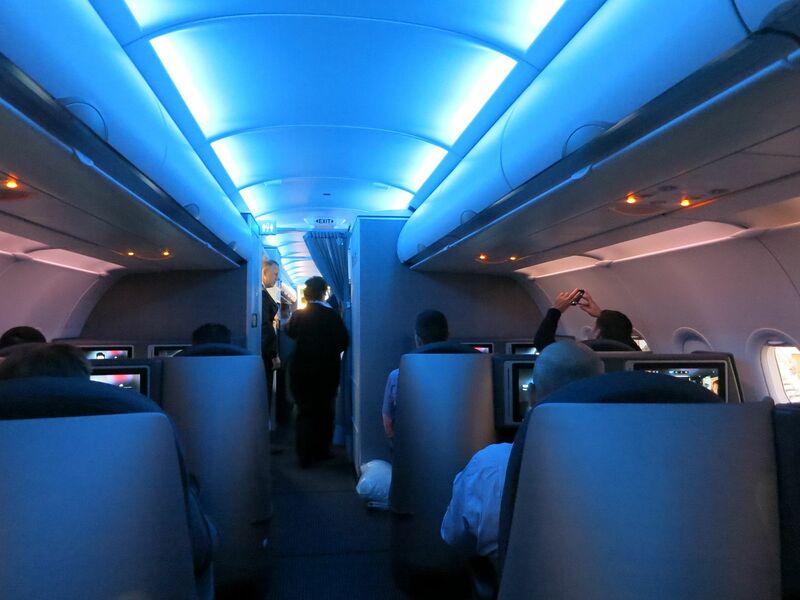 On Tuesday I flew American Airlines’ inaugural Airbus A321 flight from Los Angeles to New York JFK. That’s their new plane with their new premium product for New York – Los Angeles and San Francisco flights. And it was great. I paid for the tickets myself and upgraded to business class. I flew to Los Angeles the night before — hotels near the airport were exceptionally pricey, with the Sheraton going for over $300 and no standard rooms available for redemption. The Hilton LAX was $209, I thought about burning 30,000 HHonors points but… I blew through all of those due to last year’s devaluation, and I have only 24,000. The Hyatt Place offered only Diamond Guaranteed Availability for $229, I thought about the Crowne Plaza LAX for 25,000 points but I really didn’t want to stay there. Initially I booked the Custom Hotel LAX for $109 and joined the ‘Joy of Life Club’ (which partners with Virgin America for earning so I wasn’t going to have to strand points.) Ultimately a couple of days out the price on the Hyatt Place dropped way down and I rebooked there (for a similar price, might as well earn a stay credit towards status). The airport shuttle worked great this time, though I do wish it started running before 5am. I turned up at the airport around 5:15am for my 7am flight, figuring I could get some coffee and breakfast in the Flagship lounge. I’ll miss my British Airways Gold status when that expires in a couple of months, and I’ll be relegated to the regular Admirals Clubs rather than the first class offering. 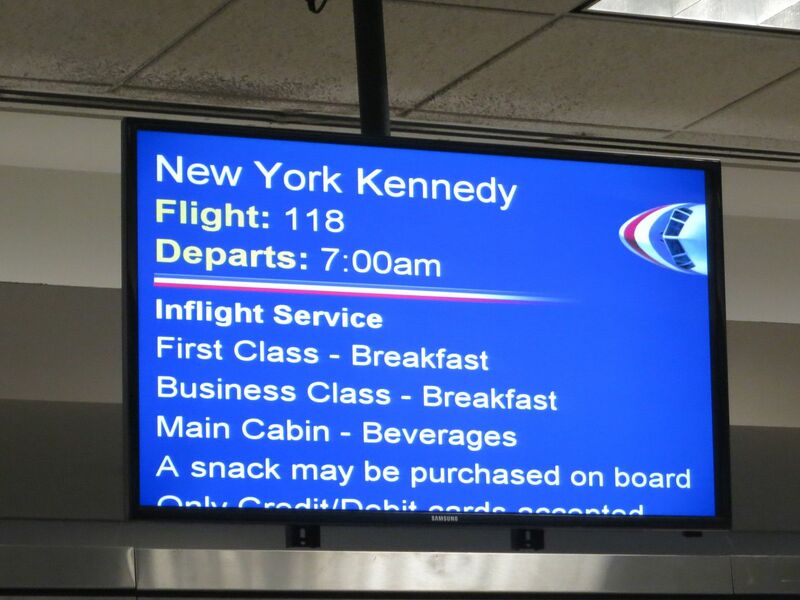 I went down to the gate around 6am and there were local executives on hand, and even American’s Vice President of Marketing Fern Fernandez (who at US Airways was in charge of Dividend Miles, and worked at Worldperks before that). Lots of hand shaking, with American folks and also frequent flyers on the flight. 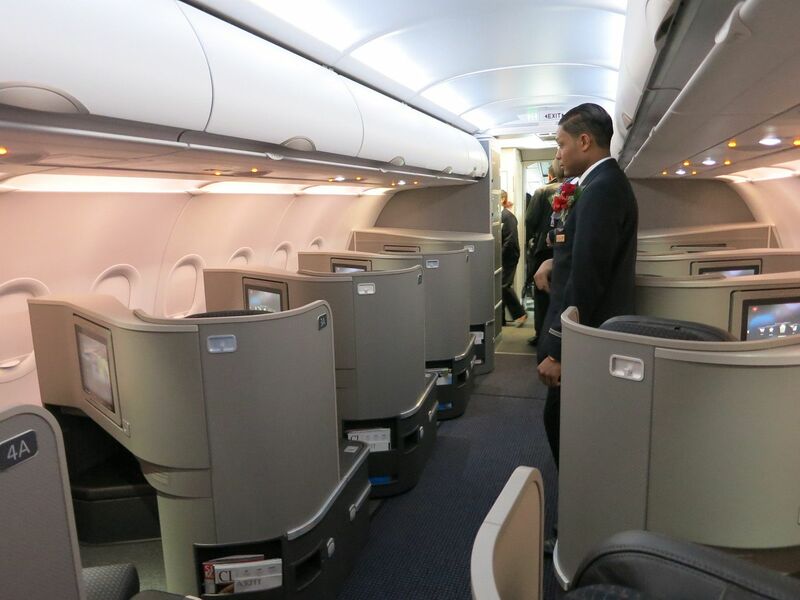 There were a few people in the premium cabins who had no idea what they were in for (lots of surprise and giddiness upon boarding) but many were onboard precisely to fly the inaugural. I was surprised that there wasn’t any other fanfare at the gate, no speeches or ribbons being cut. But there was clearly an air of excitement. It’s funny, I had already been on board the plane last month when I crawled around it at JFK. But I was still excited. This was actually my very first inaugural flight. It probably took awhile to board, lots of gawking, and though I had already been on the plane I was still snapping photos as I came through. The first time, for instance, I didn’t notice a special pet feature at the front of the first class cabin. There’s no place for a pet in cabin to go in the first class seat for takeoff and landing. 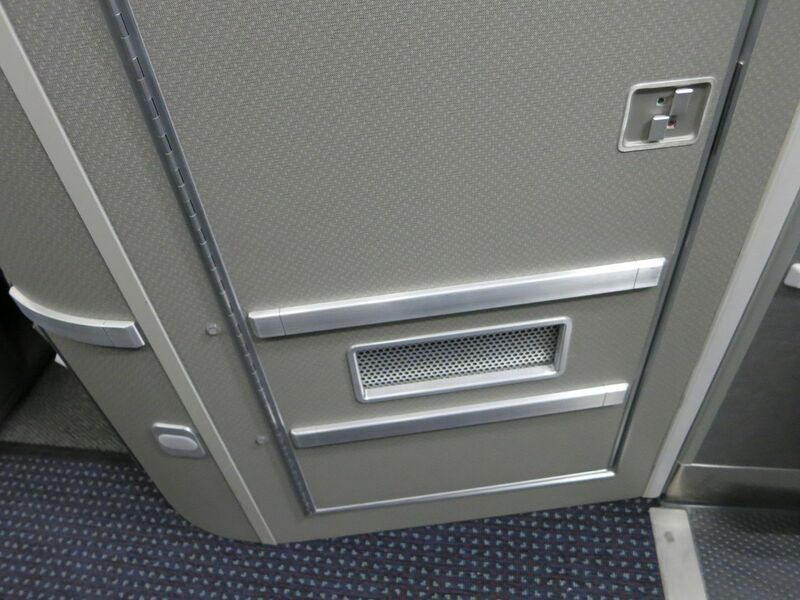 So there’s a compartment in front of the first row that’s specially ventilated. I found my business class seat, with an oversized pillow and blanket package, a noise cancelling headset, and a gift bag for the inaugural flight. The ‘Wolf of Wall Street’ t-shirt and poster struck me as odd, but this is a Los Angeles departure and this flight is going to sell to Hollywood. There was a greeting from Paramount Studios in the bag as well. I met my seatmate, who works with Hollywood and splits his time between New York and LA, and was even more excited than I was. I was actually honored to learn that he had “done his research for the flight” reading my earlier posts on the plane. We chatted a bit about the flight, his experiences on the route several times a month, and award booking possibilities. 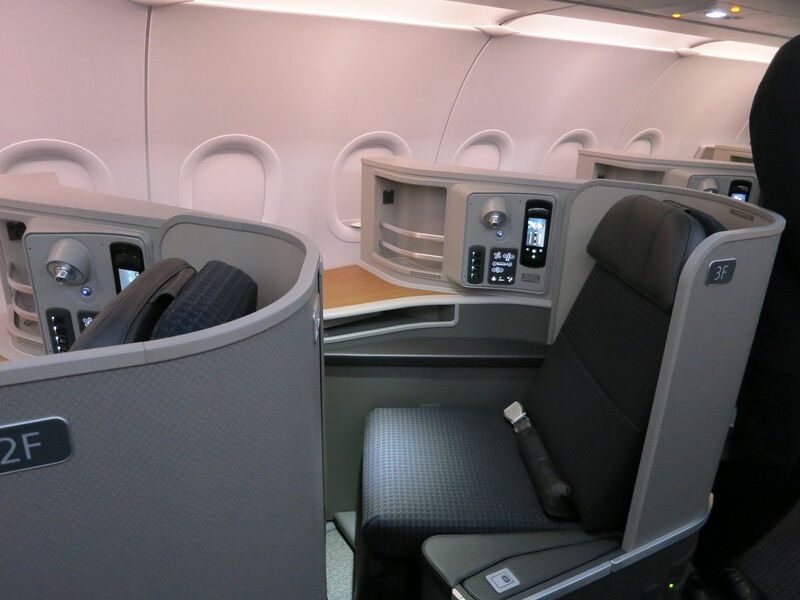 The business class cabin is just really sharp looking. Shortly after takeoff we were offered champagne and cupcakes to celebrate the inaugural. The cupcakes were really good. I declined seconds of the champagne, but did have another cupcake. One area that I do think needs work is catering. 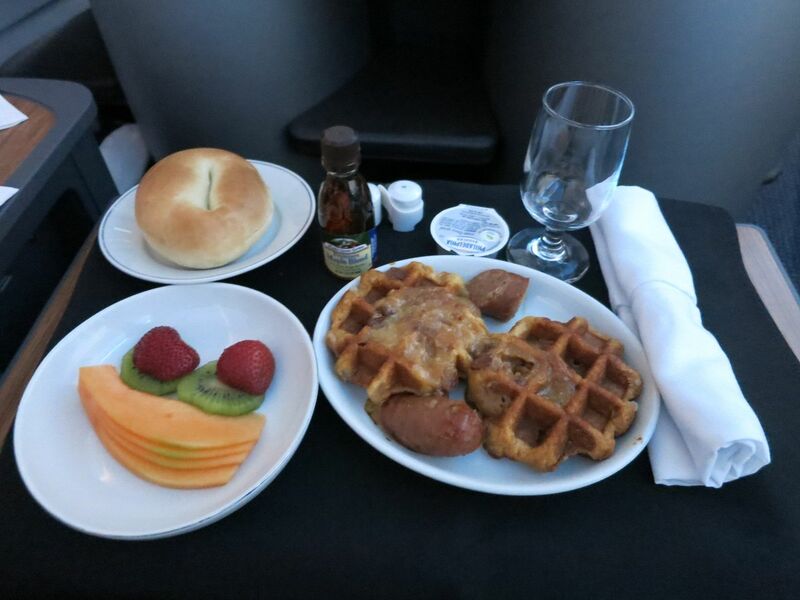 I used American’s pre-order feature (you can choose your entrée online in premium cabins between 24 hours and 30 days prior to flight) to make sure I’d get the Belgian waffles. I didn’t want eggs, and don’t like just cereal. The toppings were flavorful enough, but the waffles just didn’t heat well and came out hard. 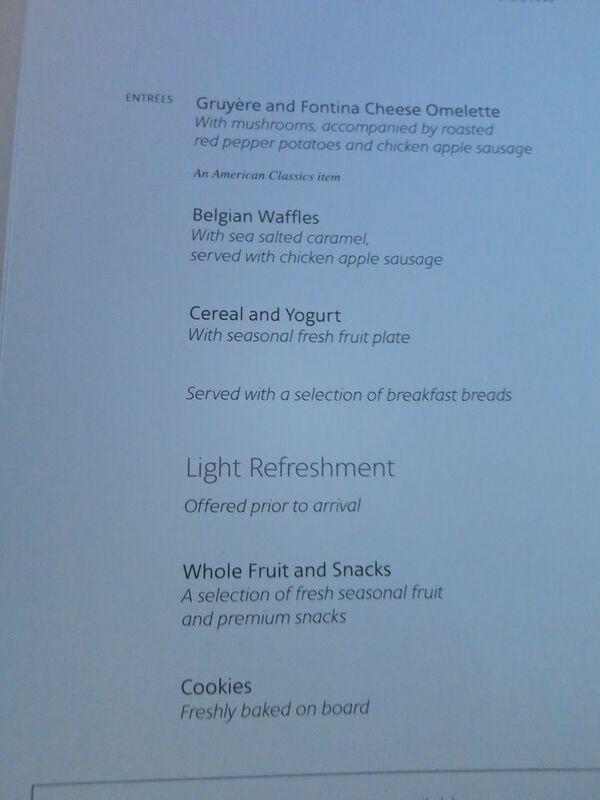 I understand that currently the first class catering is very similar to business class, but that they’re in the process of rethinking things. I was hugely impressed by the inflight entertainment system, there are plenty of things to watch. 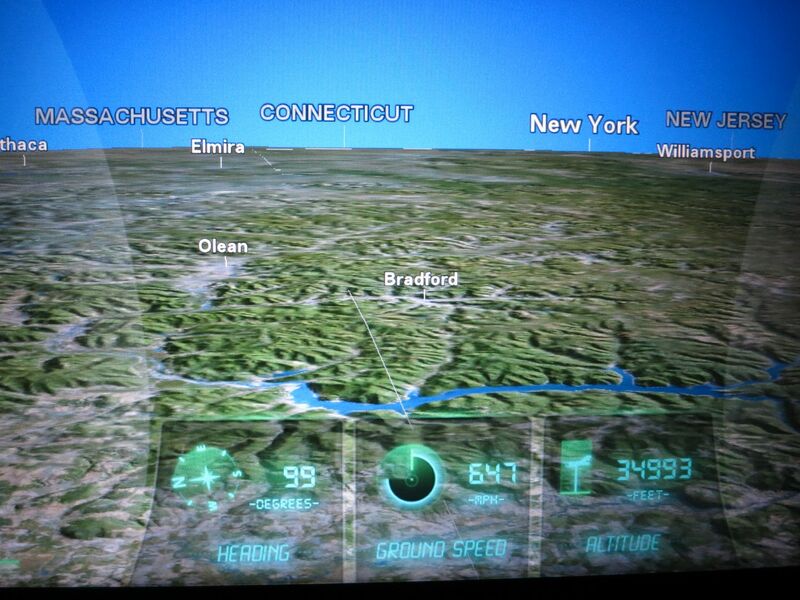 But what I loved the most was the system itself and the flight map and camera features. The system is controlled both by a remote at your seat and as touch screen. It’s like a tablet, and hand motions can even zoom in and out on the map. There are several views, as well, including a ‘cockpit view’. Great for airline junkies. Ultimately I thought the business class seat was great. It’s the same basic seat that United offers, but seemed to be better padded. It’s also perfectly possible to get up from the window seat and get into the aisle without disturbing your neighbor (by seat opponent did that before I even thought to move). It’s not “all aisle access” and that would be harder to do if the person in the aisle were in bed mode. But, well, that’s what first class is for I suppose..! Here’s the rollout schedule. With the smaller plane, we get more frequencies (there will be 13 Los Angeles flights, all with the new plane, come summer — and they increase from 4 to 5 San Francisco flights, all with the new aircraft, starting mid-June). Two Airbus A321s entered service on Tuesday. By January 15 there are scheduled to be 5 daily flights with the aircraft, and six by January 31. 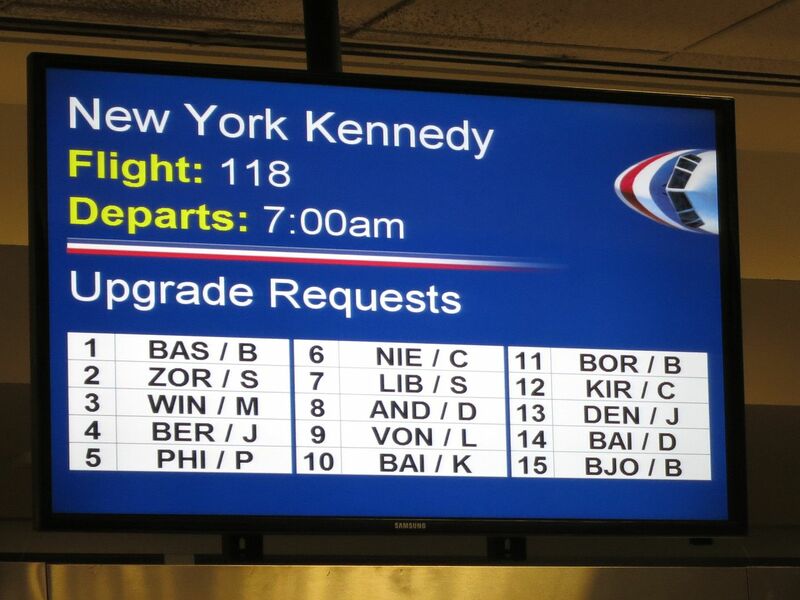 They’re increasing flight frequencies, up to 11 JFK-Los Angeles flights each way on April 1 and then 13 come summer. All JFK – Los Angeles flights will be operated with this aircraft starting May 8. 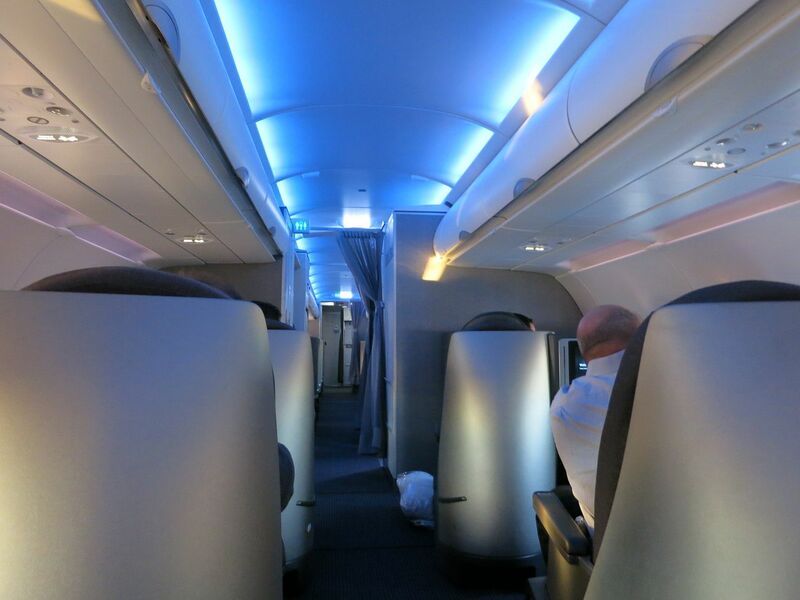 This new plane will start flying New York JFK – San Francisco March 6, on 2 of American’s 4 flights. Three of the 4 flights will be operated between New York and San Francisco starting April 1. And American will increase to 5 San Francisco flights, all operated by the A321, on June 11. Will It Work – For Frequent Flyers, and For American? This is a fantastic flight product. As a customer, I love it. Some of the folks I spoke with were concerned about upgrades. 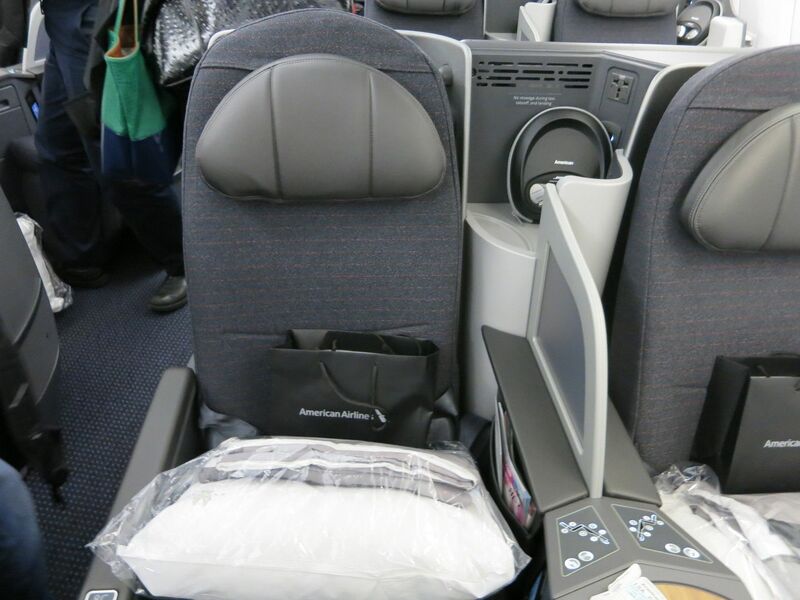 There are fewer business class seats on the A321 than there is with the current old recliners on the 767-200. But there are more first and business class seats combined, and there are going to be more flights. Crucially, the percentage of premium cabin seats is really high — 29% (compared to a fleet average of about 13%). Whether upgrades are easy or hard depends on whether the better product spurs more premium cabin ticket sales. My guess is that upgrades will clear for top tier elites on this route, but that they will hold back awarding them until close to travel while they figure out just how many seats are getting sold last minute. The real question over time is going to be the economics. As the only airline serving New York – Los Angeles with a three cabin product, they should be able to sell first class seats. The first class cabin is very private, and will be attractive to Hollywood stars important enough to get out of business class. My guess is that 10 first class seats per flight, 130 per day, will be too many (great for award availability eventually!). If I had to speculate I’d say they’ll eventually want to cut back to 6. On the San Francisco route I’d be surprised if as many first class seats will be sold. 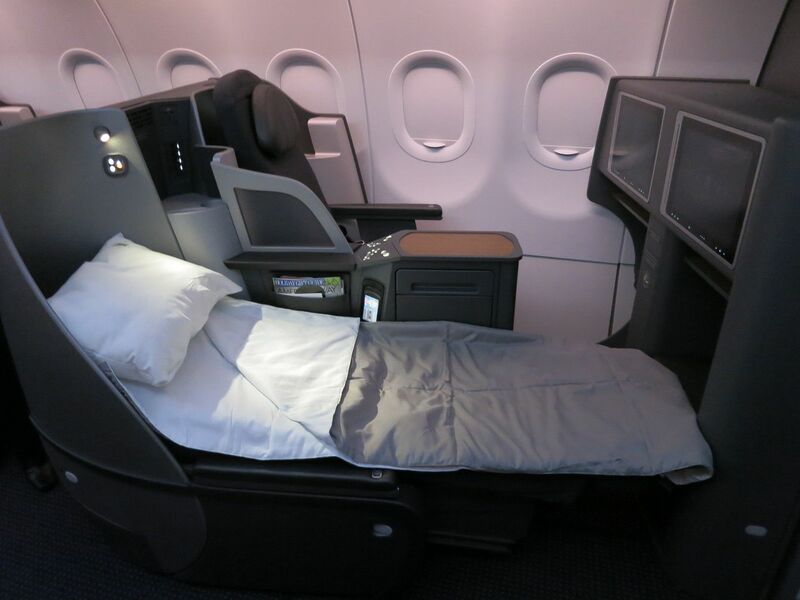 This plane gives American a business class that meets or exceeds the competition, and the best domestic product in the sky with their first class. 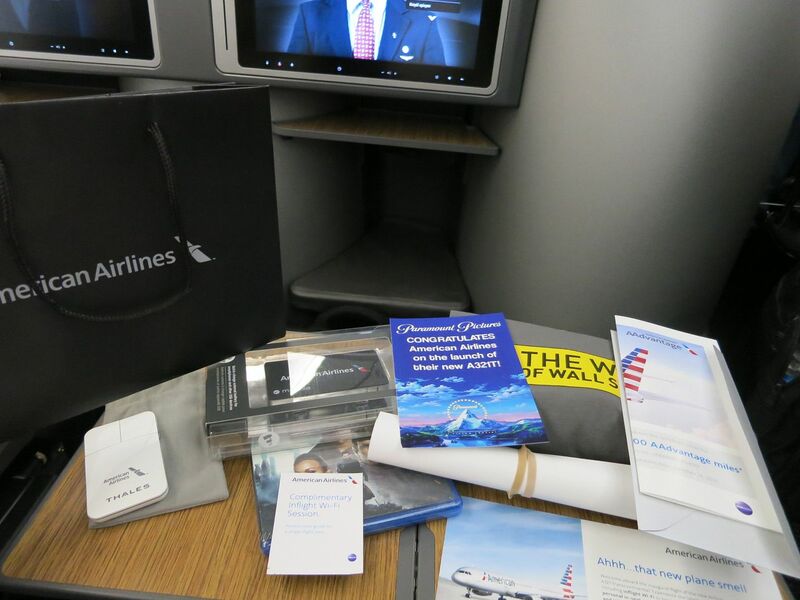 Now I want to see the product work for them, with the merger I’d love to see them do well with premium product offerings early, putting that at the forefront of thinking as American and US Airways proceed with their integration. Great seeing you after you landed at JFK. I’m working on my trip report of the flight back in First – should be ready tomorrow morning! I’m really surprised nobody has tried a premium product on LAX-YYZ. It seems like I’m always seeing semi-famous Hollywood types on that flight. Glad to hear they are re-thinking the First class soft product. No real difference with Business class and with Biz already lie-flat it’s hard to feel the need to pay up in cash or miles unless you really need the privacy. Agree with Lark, read SFO777’s F report and it was pretty darn good! Beautiful Business and First cabins! I’ve typically been fine with Economy on domestic flights, but this may make me think otherwise. So, do you think there’s any chance of seeing this ex PHL after the merger?? @Andy – I don’t, there’s really only a couple of truly premium markets in the US. New York – Los Angeles especially is different from the rest. Gary, did they board through door 2L? 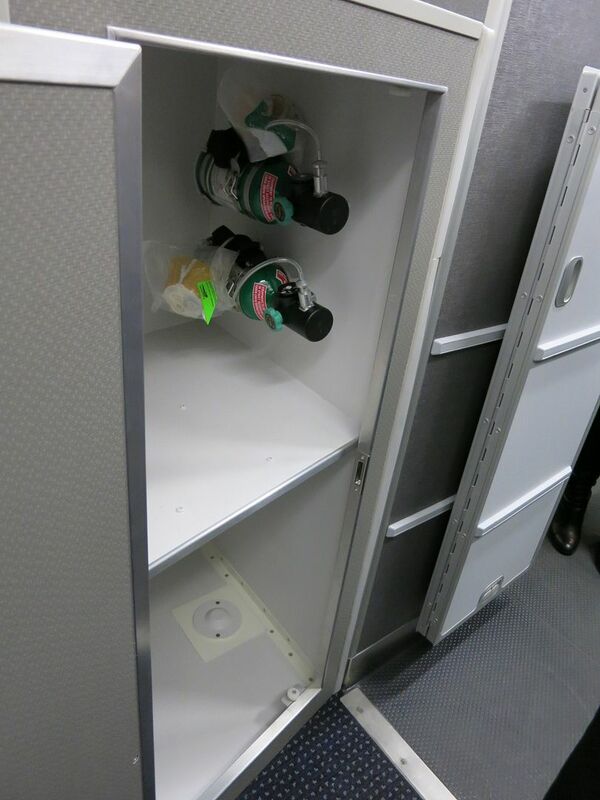 I know that was something they stated they would do to make the F cabin more private during boarding. I know it’s not preferable to many airlines operating the A321 due to the proximity of 2L to the engine. Gary, you mention you’re being relegated to normal Admirals’ Clubs this year since your BA status is expiring. Given that AMEX plat no longer gives AC access, are you just straight up buying a membership (with cash or miles)? Hey Gary, did you find enough variety on the IFE for the duration of the flight? Sometimes it seems there’s lots of choices, but most of which is just mindless sitcoms or low-end 2nd and 3rd movies . . . and, did the USB ports work? There was a note on the AA site saying something that they weren’t working yet, but the AC power ports were working . . . just wondering. Flying the JFK-LAX route on Friday. Was initially booked into First on an upgrade (2A), but found out yesterday I was downgraded to Business . . . oh well, but still looking forward to the flight . . . there are still empty seats in first, so maybe I can plead my case to a sympathetic gate agent . . .
#Erndog Well I can’t really tell you if you will be entertained by what was loaded but the options struck me as impressive, I worked through the flight. I didn’t try the USB ports. Power was working. @CW I expect a soft landing, at least I haven’t heard of BA changing the policy of dropping status no more than a level but I admit I haven’t paid close attention. Assuming I retain BA silver I will have lounge access. 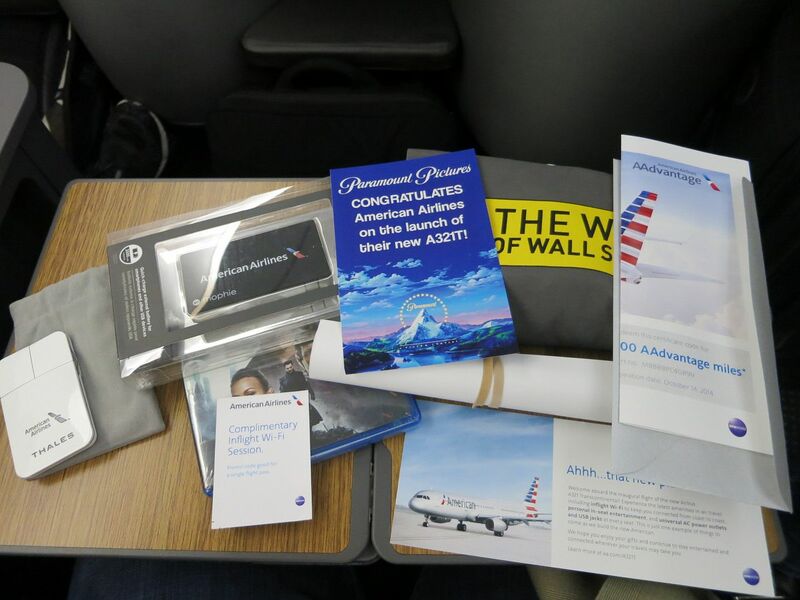 But as I’ve written on the blog, I’m likely to get the Citi Executive card 60k signup bonus / $450 annual fee and put $40k spend on it for the elite qualifying miles and that card comes with access as well. I also have plenty of Business ExtrAA points that I can redeem for a membership. @Brian I am told that is something they are working on but they were not using 2L for our flight. @Gary — BA still offers the soft landing, so “we” all get one more year of free Admirals Club access, albeit without access to the Flagship lounge…the horror! Seeing all these photos makes me long for the good old days when United introduced P.S. on the transcons. Good times. 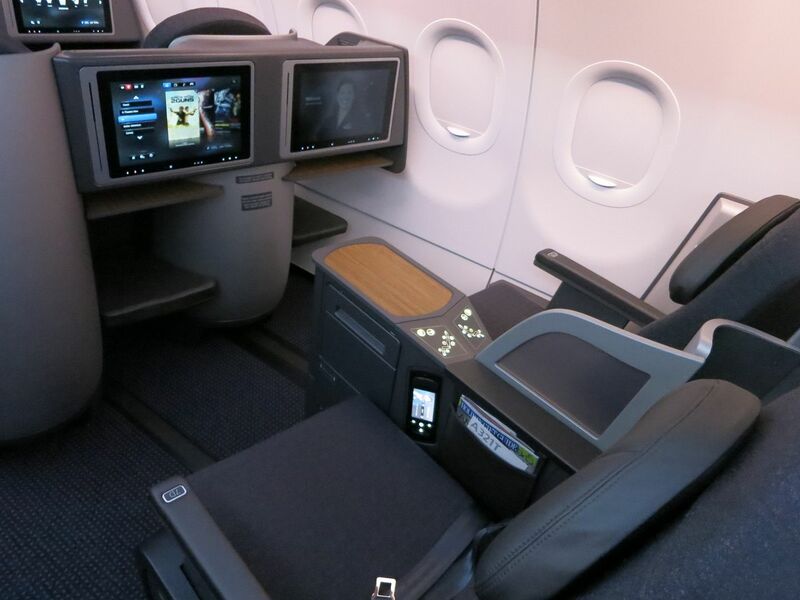 taking a closer look at the business class seats – the IFE screens seem like they are very close together – I wonder if you get the feeling that you are looking at BOTH screens instead of one when sitting in those seats? How was the wifi? Any faster than the old gogo? I wouldn’t fly United if the CEO gifted me tickets. I’m curious what’s so great about the J class. It’s the exact same as the new UA PS and that’s been out there for a while. Not to mention, every plane has it now. @David – I write above that this is essentially the same business seat that United has, with better padding and inflight entertainment. I think it’s a prettier cabin (which isn’t a huge deal) and very cool that they have a first class cabin, and a much higher percentage of premium seats. @dat4life – at the beginning of the flight i found wifi to be faster, though i did not run tests. The gift bag had free gogo codes, so I’m betting there was a disproportionate number of people online and things slowed down. 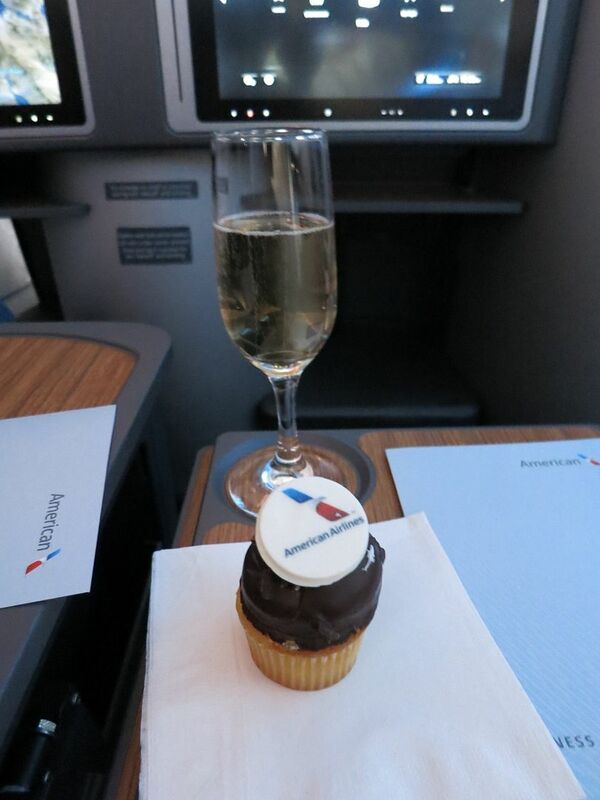 @dhammer53 – United’s ps introduction was a better hard product, but you and I remember the good old days because the soft product JFK-LAX/SFO was better pre-PS like real stemware in first class!! Thanks for the TR. Looks awesome. I just switched to the A321 flight (aa181) to lax this Sat. This is perfect timing for me as I am connecting to Qantas for Sydney all in F! Everytime I see these premium cabin stories, I keep wondering when the USA airlines will try to upgrade their coach product to something comparable to what is offered overseas. Honestly, I don’t really need a lie-flat transcon seat; indeed, westbound it’s pretty worthless, and only useful on the eastbound red-eye. Only people spending other people’s money — or credit card miles — would pay for this. But I guess that’s a pretty big crowd on a NYC-LAX transcon! Amazing product indeed. I saw you entering the Admirals Club at JFK when I was leaving for my flight to BCN. Keep on going with your great work on this blog. Thank you.